The big cities have become concrete jungles and the jungle a peaceful resort. Mumbai, the financial capital of India has over the years become one of the biggest cosmopolitan cities in the world. This city of paradoxes has the richest of men living along with the poorest on one hand and colonial architecture standing proudly with gleaming sleek new high rises on the other. 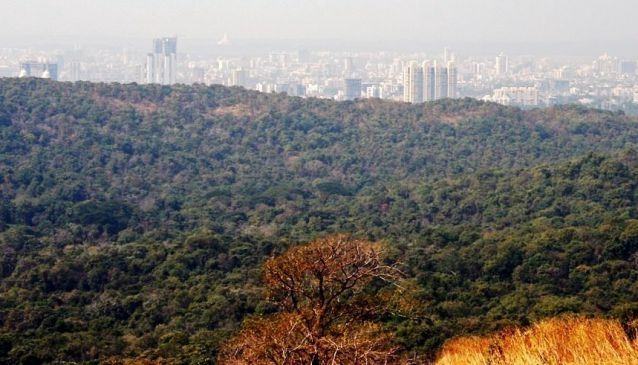 This city of concrete jungles has an irony within its fold as well and that is the Sanjay Gandhi National Park, Borivali an actual wild life National Park. Created in 1974, the erstwhile Borivali National park which was renamed the Sanjay Gandhi National Park in 1981 has a unique claim to fame. It is the only protected forest that is located within the city limits, anywhere in the world. This 104 square kilometer park is home to a wide variety of flora and fauna and is one of the most visited attractions in Mumbai attracting more than 2 million visitors every year. The Sanjay Gandhi National Park does not only have a vibrant lush forested area but it is also the home to the more than 2400 years old Buddhist hand carved Kanheri caves, a marvel in themselves. The entrance to the Sanjay Gandhi National Park is right across the big flyover on the buzzing Borivali road. The first thing that strikes you as you enter the park is the sight of the monstrosities, the huge constructions, which virtually peep into the protected forest. If you are visiting the park early morning then you would also be amazed to find the sheer number of morning walkers and joggers that you will encounter here. There is a model of the National Park near the information center that actually gives an idea about how huge the park actually is, stretching from the Western express highway to the Eastern express highway. Situated on the fringes of the Sanjay Gandhi National Park are the Tulsi lake and the Vihar lake. These water bodies are the primary source of water which quenches the thirst of the teeming millions of the city of Mumbai. The huge park has a lot of attractions for the nature lovers. More than 800 varieties of flowers, 150 types of butterflies, 36 species of mammals, 284 kinds of birds, 62 variants of reptiles and more than 5000 classifications of insects including the world’s largest moth, the Atlas Moth, inhabit this genuine forest. There are two separate tiger and lion safaris conducted in two separate areas of the park. A small population of leopards and a variety of other animals like the Rhesus monkeys, rabbits, deer like Sambhars and Cheetals and langurs also roam the wilderness of the park. The major attraction of the Sanjay Gandhi National Park is the Lion Safari Park. It is not unusual to find a long queue waiting their turn to get their safari tickets at the ticket counter here. The 12 hectare Safari park offers you a perfect rendezvous with the king of the jungle as you travel in specially designed safari buses full of safety features. The many lions and tigers (including white tigers) in the protected area live in their natural habitat leading a life as they would in their natural wild setting of a dense forest. Special caged enclosures are also there in the safari park for the wild cats to eat and sleep within. The safari park itself is surrounded by a 5 meter high and 2200 meter long protective wired fencing that demarcates it from the rest of the National Park and has two watch towers as well. The Kanheri Buddhist caves located at a distance of about 7 kms from the entrance gate of the park is another major attraction within the Sanjay Gandhi National Park. These 109 beautiful hand carved caves are a wonderful example of the Buddhist architecture of a bygone era. Regular shuttle bus service is available for visitors from the entrance gate of the park to the Kanheri Caves. Bicycles are also available on rent for the visitors to commute within the perimeter of the park. Other attractions in the National Park include a ride around the park in the toy train “Vanrani”, short boat rides in the lakes, trekking, rock climbing and lots and lots of fresh air and serene and peaceful environs. A great family destination, a nature lover’s paradise or an adventure seeker’s haunt, The Sanjay Gandhi National Park is really a very unique place to visit when in Mumbai. So, come and enjoy this “Jungle” in the midst of the “Concrete Jungle” and cherish memories for life.